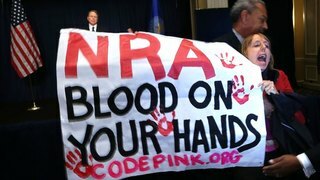 Behind the NRA’s Money: Gun Lobby Deepens Financial Ties to $12 Billion Firearms Industry | Democracy Now! a longtime investigative reporter who has covered money and politics for the past 20 years for the National Journal, the Center for Public Integrity, and is now is a freelancer. His latest article is ”NRA Gun Control Crusade Reflects Firearms Industry Financial Ties,” co-authored by Huffington Post reporter Ben Hallman. NERMEEN SHAIKH: We conclude today’s show with a look at the connection between the firearms industry and the National Rifle Association. Throughout its history, the NRA has portrayed itself as an advocate for individual gun owners’ Second Amendment rights. But a new investigation finds the group has come to rely on the support of the $12-billion-a-year gun industry, made up of firearms and ammunition manufacturers and sellers. Peter, welcome to Democracy Now! Just what are those ties? PETER STONE: Well, the ties have become extensive in recent years. They date back principally to 2005, when the gun industry was facing a major crisis. It had been hit by dozens of suits from cities in recent years prior to that, and they were facing significant financial costs from this litigation. Litigation was aimed at recouping healthcare and other costs from gun violence in major cities. And the gun industry turned to the NRA for its lobbying muscle, which is legendary in Congress. They needed help. And they came up with a plan to obtain a liability shield for gun manufacturers and distributors. It’s the only industry in the country that was able to secure such a shield from most litigation. The NRA pushed it very hard for a few years, and it passed Congress in 2005, providing unique protection to gun manufacturers. At the same time, that very same year, the NRA launched a new fundraising program aimed at corporate donors, most of whom have been firearms companies, ammunitions makers. And that program has boomed since it started in 2005. There are no precise numbers, but the NRA posts data about the range of contributions from firearms industry firms. And according to a report in 2011 from the Violence Policy Center, between $14 million and $39 million came into NRA coffers in that period. This is probably a conservative estimate. Most of the NRA’s money is still from other sources, the bulk of the money, but the firearms industry has formed a kind of symbiotic relationship with the NRA in recent years—it benefits both. NERMEEN SHAIKH: Peter Stone, can you say a little about who the executives are who serve on the board of the NRA? PETER STONE: Well, the NRA has a very large board, about 76 members, many of whom are prominent conservatives, including Grover Norquist, Ollie North, film star Chuck Norris and many others. They have a small number of industry executives, as well, who are on the board. And at least a few of these are from fairly large donors; Brownells, Barrett Firearms, their top executives are on the NRA board. Interestingly, both of these companies are distributors or makers of these high-capacity magazines, which are now facing significant criticism and legislative threats because of concerns that they have been linked to many of the mass shootings in the last couple of years. So it probably gives them a little more input and influence at the NRA as they fight these bans. AMY GOODMAN: Can you talk about how the NRA’s positions increased gun sales for the NRA’s patrons, the weapons manufacturers? PETER STONE: Well, it’s anecdotal, but there’s obviously evidence in recent years that one of the major pushes of the NRA over the last decade has been to pass laws in states called “concealed carry laws,” which are now existing in almost every state. The president of one of the big companies, Sturm, Ruger, in Connecticut, in a conference call with analysts back in 2011, said that they were looking for a nice uptick in sales in Wisconsin after the—that state passed a concealed carry law. These are ones that, you know, the NRA has pushed in Second Amendment grounds, self-defense grounds, but they obviously have been good for the firearms industry, too. NERMEEN SHAIKH: Peter Stone, could you say what you think the NRA’s influence will be on the gun control legislation or discussion that’s now going on? And I want to encourage people to tune into our inauguration special Monday from 8:00 in the morning 'til 1:00 in the afternoon. And Tuesday to Friday, we'll be at Sundance.